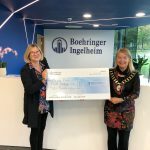 Councillor Sandra Ingham, Bracknell Town Mayor, is delighted to announce that Boehringer Ingelheim (BI), a family-owned German pharmaceutical company based in Bracknell, has recently contributed to the 2018-19 Mayor’s Fund, which is dedicated to supporting youth outreach learning and participation programmes at South Hill Park. The programmes provide a variety of targeted and open-access projects to young people and the wider community. BI has contributed as part of its Building Healthier Futures programme, which aims to support the local community through sustainable partnership activities that have an education, health and wellbeing focus. Every year the Bracknell Town Mayor identifies a local charitable cause to dedicate fundraising efforts towards. Councillor Ingham has decided that funds raised during the mayoral year for 2018-19 will be directed to support the following youth groups: 11/17 drop in arts sessions, Wilde About Arts youth theatre and Missed Out, the young producers’ programme. These programmes provide a variety of targeted and open-access projects to all youth including vulnerable, disadvantaged young people in the local community, which make a huge positive impact on the young people who participate. 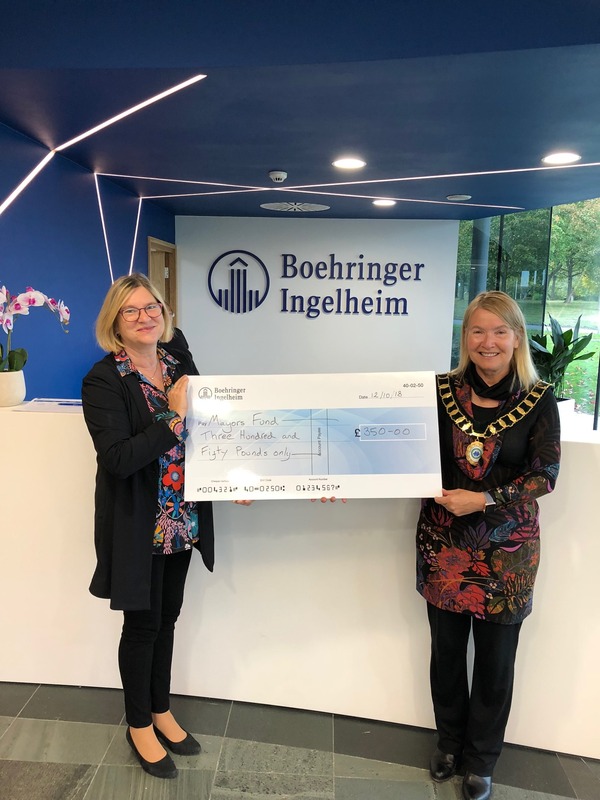 Bracknell Town Mayor Cllr Sandra Ingham recently visited Boehringer Ingelheim at their Head Office to say thank you for the donation and advocate for the positive transformational benefits the programmes bring about in the young people they work with. This is a cause very close to our Bracknell Town Mayor’s heart and something the company shares enthusiasm for. Sabine Nikolaus, Country Managing Director and Head of Human Pharma for the UK said, “We are delighted to support Bracknell Town Mayor’s Fund and South Hill Park in this way. Our Bracknell Town Mayor’s ambition to foster positive outcomes for younger people through the benefits of art participation should be applauded. We are committed to working to ensure those who would benefit can continue to access the programmes and will continue to generate support for this area”. Speaking after the meeting with Boehringer Ingelhiem, Councillor Ingham said, “I am delighted to accept this generous cheque in support of youth learning and participation programmes at South Hill Park Arts Centre. Such programmes rely on charitable donations to continue to flourish and are so good for our young people, building their confidence and resilience at the same time as nurturing their interest in the arts. Parents regularly advocate the transformation they see in their children as a result of them and they play a vital role in helping to build important social skills”.